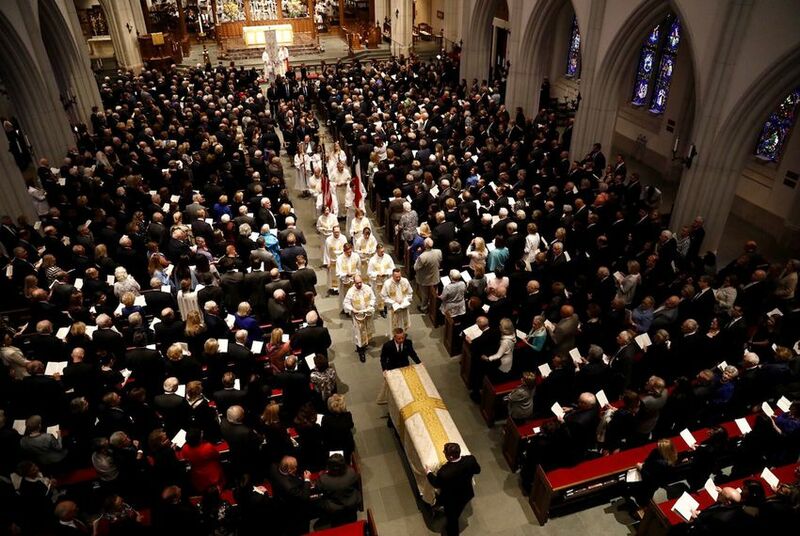 Former first lady Barbara Bush was remembered as the outspoken matriarch of one of the country's greatest political families at a Saturday funeral at St. Martin's Episcopal Church in Houston. As the wife and mother of two U.S. presidents and two former governors, Mrs. Bush sat at the head of a political dynasty that has defined both Texas and American politics for decades before her death on Tuesday at the age of 92. 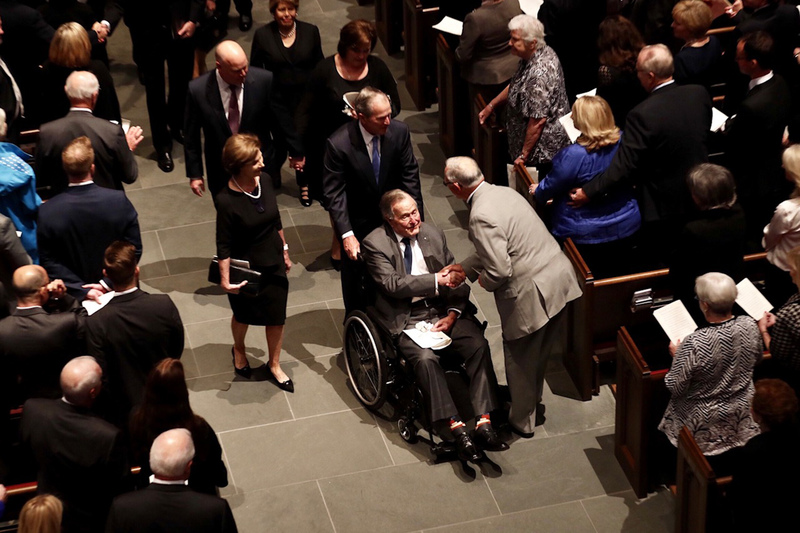 Political leaders from Texas and the United States, along with about 1,500 invited guests, gathered for the service — a congregation that included former Presidents Barack Obama, Bill Clinton, George H.W. Bush and George W. Bush and Texas Gov. Greg Abbott. Fittingly, Texas and U.S. flags lead the way as as Mrs. Bush’s casket was carried into the church prior to the start of the 90-minute service. Susan Baker, a longtime friend of Mrs. Bush and the wife of former Secretary of State James A. Baker III, and Jon Meacham, a presidential historian who published a biography of the first President Bush in 2015, also spoke. Meacham served the role of historian for the funeral, speaking of Mrs. Bush’s work in public service, her 73-year marriage and his own friendship with the former first lady. “She was strength herself, and with her tongue sometimes sharp, she was as honest with herself as she was with the rest of us,” Meacham said. Former first ladies Michelle Obama, Laura Bush and Hillary Clinton, as well as current first lady Melania Trump, were present for the funeral. President Donald Trump did not attend the funeral to “avoid disruptions due to added security, and out of respect for the Bush family and friends attending the service,” according to a White House statement. The 1953 death of Mrs. Bush’s daughter Robin was mentioned during the service as a marker in Mrs. Bush’s life; Baker cited it as a source of her compassion during her life. “Barbara’s motivation to help others was never about herself, but about giving love and support to those in need,” Baker said. Following the service in Houston, the funeral procession traveled to College Station where a private family ceremony was held at Bush's burial site, next to Robin on the grounds of the George H.W. Bush Presidential Library. Texas A&M University’s Twitter account tweeted a photo of the procession arriving in College Station, where hundreds of people could be seen lining George Bush Drive to pay their respects. The motorcade then turned onto Barbara Bush Drive, which was lined with members of the Texas A&M Corps of Cadets in uniform saluting the passing former first lady, and proceeded to the presidential library for the private burial. Disclosure: Texas A&M University and the George H.W. Presidential Library and Museum have been financial supporters of The Texas Tribune, a nonprofit, nonpartisan news organization that is funded in part by donations from members, foundations and corporate sponsors. Financial supporters play no role in the Tribune's journalism. Find a complete list of them here.